As a child I grew up in east New York. My daily walk to school was littered with crack vials and syringes. It was a common to see dog fighters and drug dealers with pit bulls; drugs, violence and dealing seemed to go hand and hand. Who would’ve thought that almost 20 years later this kid from the ghetto would be running a pit bull rescue in Texas? When I moved away in college, I needed a hobby to distract me from the culture shock of leaving my concrete jungle. I decided to work with animals and volunteer for a local rescue. At first it was wildlife and reptiles. Then one day while in Petco, I met up with dog rescuers and started working with canines. By this time I was a mom of two boys, Isaiah and Charles. They were three years apart and they both were diagnosed as autistic. They have Asperger’s Syndrome, which means they’re functioning but they have several issues with social behaviors, and they have trouble sitting still for their teachers. Charles had a lot of problems with his behavior including impulse control, and Isaiah had gone into a regression. He was removed from his homeroom class and transferred to a class for kids with special needs. Isaiah stopped recognizing letters, numbers and colors. When he was at his worst, he lost bowel control and had horrible acid reflux from stress. As a result, I had to quit my job as a DJ and give up my application to go to police academy. I wanted to get my children a dog but I wasn’t sure how that would work with their personalities because my boys can be emotionally distant. Or at least that’s what I thought before we got Bosier. Bosier was a red nose American Staffordshire terrier who was found furless and covered in sores on a highway in Grand Prairie, Texas. He was barely growing his fur back and under the care of another rescuer when I met him. As weeks passed, I began to develop a relationship with this dog. Although I was normally apprehensive of pit bulls, I wasn’t fearful of him because I just saw a dog that loved everyone around him no matter what. I lived two blocks from the vet he was seeing, so I volunteered to take him in as my foster. I brought Bosier home and the boys seemed to take interest. Charles asked me what type of dog he was; when I told him that Bosier was pit bull, Charles seemed to just shake it off. This wasn’t abnormal behavior of a child with his condition. As the weeks went by I noticed that unlike with other dogs, the boys seemed to take a liking to Bosier—and he didn’t seem to mind either! In fact, the dog that had been in treatment for almost a year was finally growing his fur back and perking up. The boys would come home and climb into Bosier’s crate, and the three would take a nap or watch cartoons. From that moment forward, we decided to foster pit bulls. The next dog we fostered was a momma dog named Kisses who came with nine sick pups. The boys would take Kisses for a walk around the block every day with their dad trailing behind them. I owe all of their progress to one special dog: a pit bill named Bosier. One day Charles came in laughing. It turns out one of the local bullies who had teased him for being a “freak” was walking down the sidewalk the opposite direction as them when he saw the boys. Kisses looked at him and the bully decided he had something better to do. I had never seen my son feel so empowered. 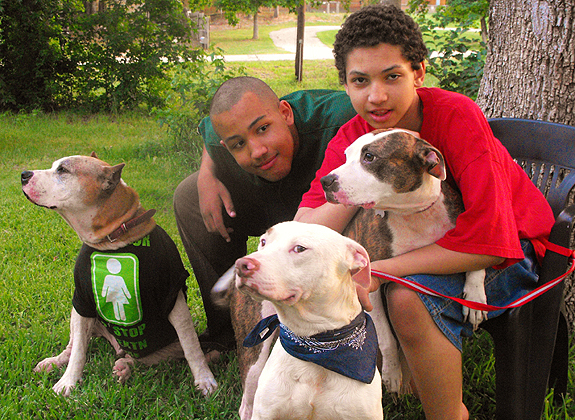 Three months later we started our pit bull rescue: Brooklyn’s Home for Unwanted Bullies, Inc.
It’s been almost eight years since we opened our door, and we’ve saved 250 dogs. Our life has turned into a simple fairy tale. Today Charles is in high school and Isaiah is beginning junior high. Both of my sons are mainstreamed and are in regular education classes. Charles plays the baritone in his school choir and Isaiah, the little 7-year-old boy who had forgotten how to read and screamed when you touched him, is now a trumpet player in the band. This year both boys went to competition and came back with first place in their divisions. They’re the same boys who hated to be touched, and now they come home everyday from school tell me about their day. No one would believe these were the same children who would throw up meals at the thought of going to school or cried when they got their hair cut. My sons are both on the honor roll, and they both have regular sleepovers with the dogs and attend parties. I think they’ve progressed so far because they’ve had the chance to work with pit bulls—the same dogs who know what it’s like to be looked at as weird or different, who have been treated badly by people and who know how it feels. The boys take them for walks and play fetch with them, and that’s helped their socialization. I owe all of their progress to one special dog: a pit bill named Bosier (who, by the way, was adopted to an amazing family and who also has lived happily ever after). @skreidle Thanks for the clarification. Great story. Dogs do so much for us, I am amazed at how badly some people treat them. I have hope for humanity, though, when I read inspiring stories like yours. @ShawnLowe Thanks for your comments, this story is sooooo inspiring, it gives us all hope. I love this story!! I’m a huge advocate of the breed and this brings me nothing but joy! @LM Thanks for commenting, it brings us joy too! I can relate to this story. My pittie is 6 1/2 yrs. old. I have a grandson who is 3 yrs. old and is autistic. He is a completely different child when he is with his buddy Jersey. There’s a light in his eyes when he sees her. He’s calmer when he’s with her. Jersey loves everyone, but she has a special bond with Riley. @Jerseysmom The bond between a dog and a child like that is so incredible, it’s like the dog just knows. Never underestimate the healing power of all animals. @LM You’re generally right about coloration, but here’s the difference in this instance. Since its inception as a recognized breed (by the AKC in the 1930s, the breed standard has read, “nose must be definitely black”. As such, red noses have been selectively bred out of ASTs for almost 80 years–so it’s extremely rare (though not unheard of) to find a red-nosed AST. @LoriSchmidNanan Thanks, it’s truly amazing. @LoriSchmidNanan Thanks for your comments. I’m a big believer in animal assisted therapy, the healing, and personal development benefits of relationships with dogs. I can cite many times in my life where I am alive because of dogs, and how much I have learned through dogs. It’s amazing how such simple beings can enrich our lives so deeply, and change us for the better. I’ve recently moved to Texas from Oregon, and the culture shock from the general treatment of animals has been astounding. I’m a volunteer with a local Bully rescue (North Texas Bully Rescue), after being horrified by all the strays/roaming, and outside chained dogs I see. We are doing a lot of community outreach, including low-cost training classes (benefiting the rescue), and community education. I hope like the ‘starfish story’, that one-by-one, those who care, can make a difference in the lives of many. @DreamEyce Thank you for sharing that, and for all the good work you are doing for the pit bulls. Keep it up! What a beautiful story. I wish we read about these in mainstream news, there are so many wonderful stories about this wonderfully loyal breed, yet the majority of what we read has been so negative. I try to share as many of these stories as I can on Facebook. Thanks for bring it to us. Love this page by the way. Wow what a great story. I have a rednoise pit/ ridgeback that I rescued . And he is my baby .107 lbs of pure love. @BrittanySherry That’s a lotta love! Thanks for commenting. Great story ! How come we don’t hear about these things on the news? This story made me tear up! I saved my first bully in March, and he is my absolute hero… You have amazing boys, and thank you so much for the work you do with these dogs! THANK YOU EVERYONE!!! Your words of encouragement and support have helped re-energize us in this fight for the breed we love. I know Bullies have a bad rap but they can be AMAZING dogs and excellent role models. 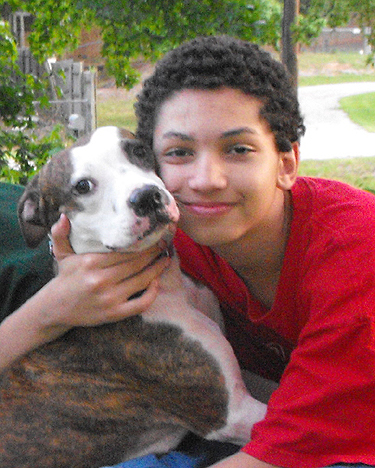 Our next step is to get a Pitbull service dog for my oldest son CJ who will be going to college in 2 years. I am looking into it and hoping this can happen. We also spoke with a trainer today about putting Meaty Dog(the white Bully in the pic) through Good Citizen training. Its not an overnight success, it will take time. But Im excited just thinking about it. Happy Tears here. What a wonderful story. Thank you for everything you have done for these wonderful dogs and, of course, your boys. God Bless you and your family! What a wonderful story! Thank You for everything you have done to help this breed of dogs! Your story has brought lots of happy tears and I am ever so grateful that your boys and the “bullies” have prospered from a loving, caring relationship! I quite understand a dog being the cure in a family. I first became enchanted with the breed when watching Daddy on Cesar Milan’s Dog Whisperer. Because of Daddy and Junior i now have a pit bull puppy of 3 months, she is the sweetest, most lovable little girl and i consider it a privilege to have her in my life. May the breed grow and prosper in the capable hands of real animal lovers. I need a little help walking our three and half month old pit bull pup. She has no problem on the leash but she just pulls so hard that she chokes herself. How can i stop her pulling on the leash like that, i would like her to walk beside us. When she is fully grown we will battle to hold her if she continues like this. @skreidle why? i tried those before it doesn’t work! then your dog expects treats at all times! that’s not the point, to bribe your dog with treats!?!? she wont listen when there’s not treats, there’s so much you can do with food, specially if the dog is a picky eater! specially with pits, since they have sooo much energy you really think something around their entire body is gonna do it!!?!? -_- i’ve seen people trying to tame their animals with that thing, and they still keep pulling! @ItzelSarayMartinez The point is not to “bribe your dog with treats.” The point is to use positive reinforcement (clicker, treats, praise, etc.) to convince your dog that if they do what you want them to do–in this case, walking on a loose lead and not pulling–then there’s a decent chance they’ll get a reward for it. So, you start with rewards all the time, then wean it down to rewards sometimes, and then further down to rewards rarely–but dogs are compulsive gamblers, and once they realize there’s even a slim possibility, they’ll gamble on it and behave, just in case.As you said, they have a lot of energy — which is exactly why force- or punishment-based methods are exactly the wrong thing to do! Punishment-based training only works as long as you’ll willing to punish every time forever.That said, I know that some dogs are picky eaters, and some won’t work for food at all — but every dog has *something* that will positively motivate them, so you just have to find what works for each dog. @ItzelSarayMartinez Additional, there’s a big difference between a bribe and reinforcement. A bribe is “Look, here’s a treat, so you should do what I’m asking.” Reinforcement is “Do what I’m asking. You did it! Here’s a treat.” Now, you can use a treat to lure a dog into a sit or a down, for example, or as an initial incentive to keep their eyes on you while walking (which is another part of training loose lead walking; if they’re constantly checking back in with you, because that’s resulted in treats sometimes before, they can’t be pulling away at the same time), but as they learn the behavior, bribery becomes unnecessary. I was told to NOT use prong collars. The dog gets a negative/painful feeling when doing the right thing. Firm but gentle is the way to go. Gentle leader gives the human more control than even a prong collar does, and does not discourage the dog from coming along when you tug. If anyone is an expert on pitbull training, it’s cesar millan! He uses corrections for bad behaviour (a quick “check” on the leash and a sharp noise) and rewards for good behaviour (affection/attention) and it works like a charm. I suggest getting the illusion collar (a cesar millan product) which helps give the right kind of correction. Start in your front yard though with short training sessions – not long walks. Stand still and when the dog pulls, give a quick correction and reward when she comes back to you. Do this until she gets it. Then start walking back and forth across yur lawn. When she pulls, give a quick correction, and start walking in the other direction. Dont ever chocke your dog or let her choke herself. Short training sessions, ending on a positive note in your own area until she gets it are the way to go. Try to tire her out with a good game of chase or fetch before a training session too so she doesnt have too much excess energy. Good luck! Try a harness it works great with my dog and is humane compared to a pronged collar. @LauraPetrolino No I have not, just read up about it on the internet and will look for one in the pet shop when i am next in town. Thanks for the advise. @ChrisMercer Gentle Leaders are AWESOME. I use one on my 100lb Am Staff we rescued from Corsicana. She used to pull so hard when we walked, now she is great to walk. But they are right Chris, this doesnt solve all. YOU need to lead the dog, not the other way around. One thing that helps is that when the dog tries to lead you, just stop walking. When the dog stops pulling give a treat and continue. Eventually she will see that sticking by your side is a good thing. @JoanWurzbacher Thank you so much for your kind words. If you want some information on getting a Pit into a Therapy Program look up http://elderbulls.tumblr.com/. She has a 11 year old Pit that she rescued that got her Therapy dog license. Love the story. I am mom of 1 pit and 5 bullies. I love this story! Thanks for recycling it. I guess I don’t mind if a bully is intimidated by a dog because of their prejudices! @ChrisMercer Once you get the gentle leader, be sure you secure it to your dog’s head when going out & about. It needs to be snug with room for just an adult finger or two to fit inside. My “exuberant” Staffie turned out to be a little Houdini with the gentle leader and we’ve had to make sure she can’t slip out of it, whereas with my older dog, although he doesn’t like the feeling on his snout (rubs nose between everyone’s legs whenver possible), I don’t worry so much that he will wriggle out.